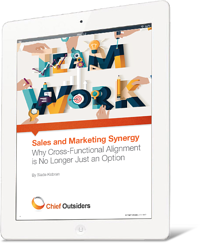 Though many organizations mistake cross-functional communication for alignment, it’s never been more critical for your sales and marketing teams to be on the same page. True alignment can have myriad benefits, including stronger lead generation efforts; better fortification against competitive forces; and a more efficient and prolific sales cycle. We recently reached out to a contingent of CEOs and sales and marketing leaders who, like you, have struggled to understand the best approach to achieving sales and marketing alignment. What follows are the top-line data that resulted from our surveying efforts, as well as a discussion around the most effective methods and strategies to achieve greater coordination. Download this eBook to find out how you can improve alignment.